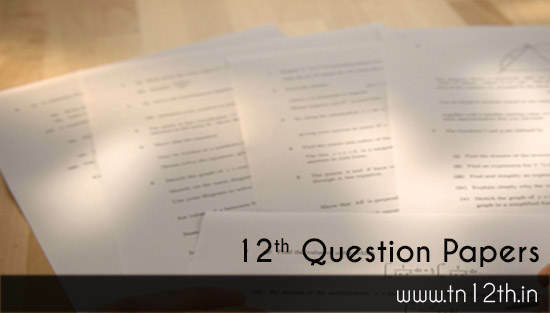 Tamilnadu 12th Question Paper with answer key can be downloaded from the official site at dge.tn.gov.in. All the Tamilnadu plus two students are requested to download the question papers along with the answer key and start preparing for your public HSC examination. The Tamil Nadu Department of Government Examination has the control over storing the previous year question papers and providing access to the students on the internet. As per the official news the 12th standard question papers are uploaded in the form of pdf documents. So, in order to read the pdf file you must have the required application at your computer or mobile. You must note that the answer may not be available on the same page. Students might have to wait for few days to get official answer papers uploaded. The Tamil Nadu Department of Government Examination is shortly known as TNDGE is taking care of all the school level and public examination throughout the state board of Tamilnadu. You can read the old Tamilnadu 12th exam question papers for getting better understanding on the upcoming TN HSC exam. All the students are advised to collect sample or model question papers and important question papers immediately because these important question papers of all the subjects are helpful while preparing for the final exam. Some of the question might repeat for upcoming examination. You must correctly choose the medium. Some of the students may be studying in Tamil medium and some may be in English medium. The Tamilnadu state board xii question papers are completely free of cost and anyone can download it from the official site even for matriculation and find out the answers at the text books and guides. Also have a look at the Tamilnadu samacheer kalvi question bank which is having standard questions for both English and Tamil medium subjects. If you are going through the important 1 mark / objective type of question papers, it would be very much appreciated. Everyone must thinking where to get the previous year Tamilnadu 12th question papers in the form of pdf file. Here we have a way for you to download directly from the official website. However, you must one thing before that the TNDGE is conducting the plus two examination thrice in every year. The first and main 12th public exam is usually conducted in the month of March and April. Those who did not get pass mark will be given first attempt in the month of June and July. still If some of the students find it very difficult to get minimum mark will be given second attempt in the month of September and October. So, you can have three set of question papers per year while downloading previous year question papers. Here is the full list of previous year question papers that can be downloaded as pdf.